Brand new Fender 2018 SRV Artist Series Stratocaster 3 tone burst. Unplayed, not been a demo in a store. 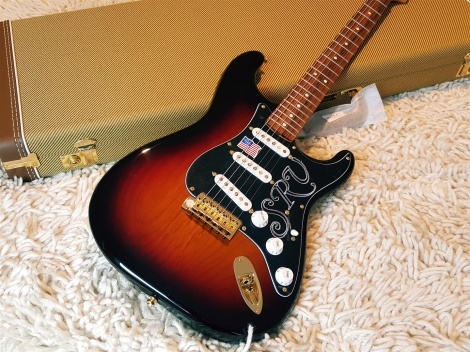 If there were a Mount Rushmore of the Stratocaster, Stevie Ray Vaughan would be one of the greats enshrined there. Fender's Stevie Ray Vaughan Stratocaster is a finely crafted like-new version of Vaughan's favorite guitar—the famous "Number One" Strat® with which he electrified listeners everywhere and seared scorching Texas blues into the top of the charts. For pure SRV tone and style that evokes one of the Stratocaster's most revered masters, this is the "one." Single-coil Texas Special pickups are over-wound for big Texas-blues tone with dynamically scorching output. With alnico 5 magnets, enamel-coated magnet wire and staggered pole pieces for balanced output across each string, they sing, scream and everything in between with tight bass, focused midrange and crystalline highs. Surely the most distinctive visual element of this instrument is its black pickguard, engraved with the big, bold initials of the man himself. The largest of the fret sizes, jumbo frets are tall and wide, which lets you get a better grip on the strings, enabling more control over them and making bends and vibrato easier. A good choice for players with larger hands and thicker fingers. As Vaughan himself preferred, his signature model features a thick oval neck profile (the shape of the neck in cross section) that imparts a distinctively comfortable fretting-hand feel, and more mass for improved tone and sustain.